Erica doesn't like odd numbers, so the box of chocolates shown above meets with her approval. The problem is that she has to remove six chocolates from the box in such a way that she leaves an even number of chocolates in each row and each column. 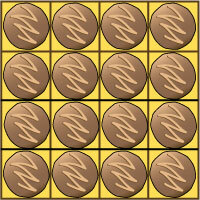 Make a 4 by 4 grid, and using pennies or other tokens as chocolates, show how she can do this. There is more than one solution.